SUMMER ROLLING OUT ON A HIGH NOTE! Weather – Warm and humid! Highs in the upper 90’s with lots of humidity. Stay hydrated! Some tropical electrical storms in the afternoon, at night or early in the morning. Similar weather predicted this week. A bit of rain on the forecast. Water – Warm and blue . Getting surface temps in the high 80’s . The fish love it! Fishing – Just nice solid biters . 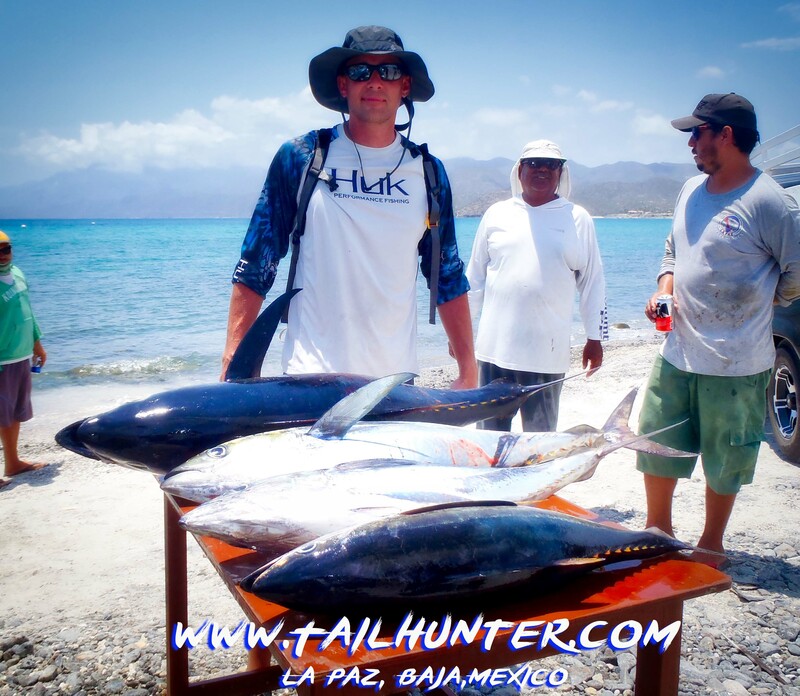 Las Arenas/ Muertos Bay holding tuna, wahoo and dorado close to shore…literally. Plus pompano, cabrilla and pargo. 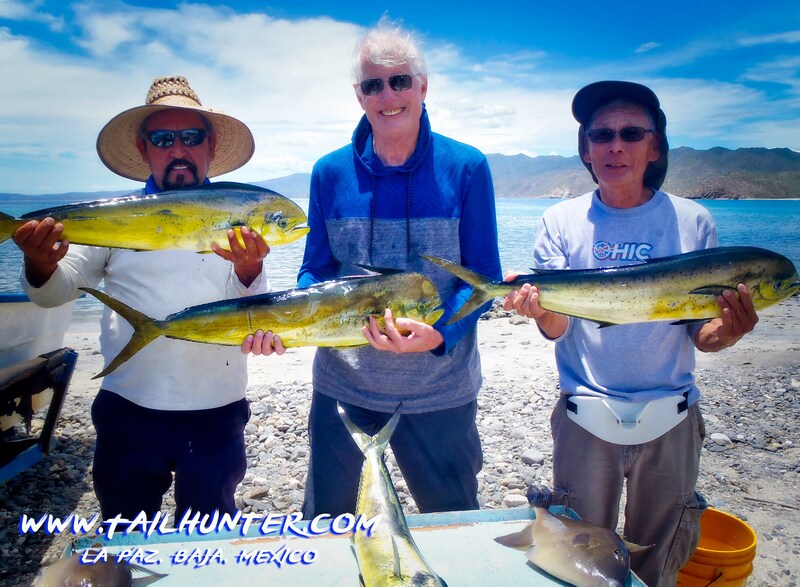 For our La Paz fleet, everyone getting dorado. Jorge Romero had a good day fishing. 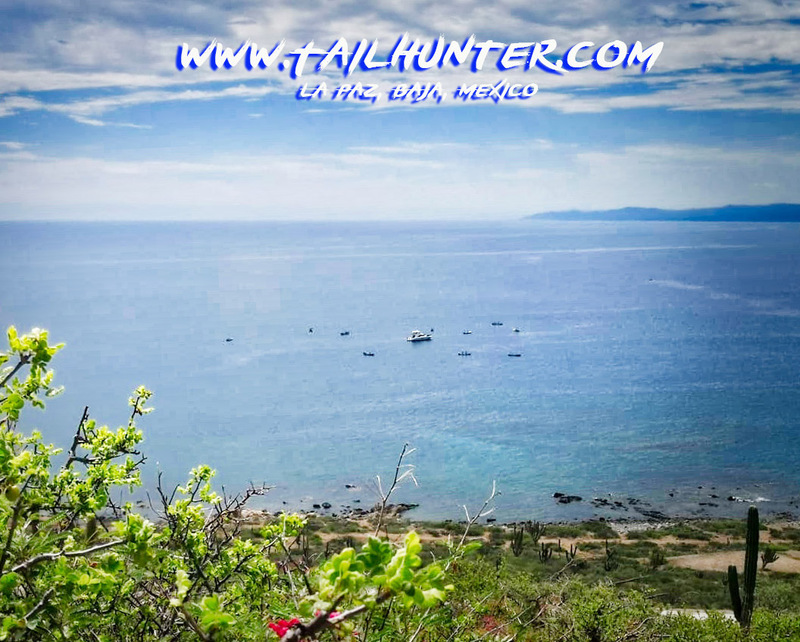 From La Paz, Jorge was fishing only 100 yards offshore (see photos below) from the beach just outside Muertos Bay, he caught a huge cabrilla and 30-40 pound tuna on sardines then got a wahoo dragging a rapala back to the beach. 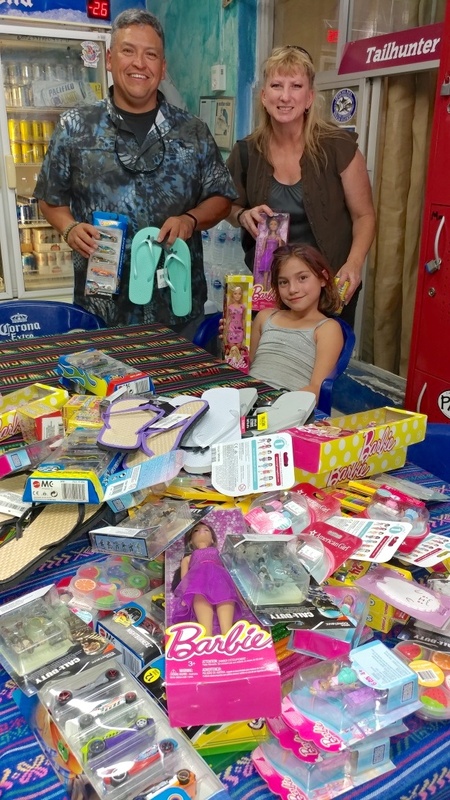 We love the kids! 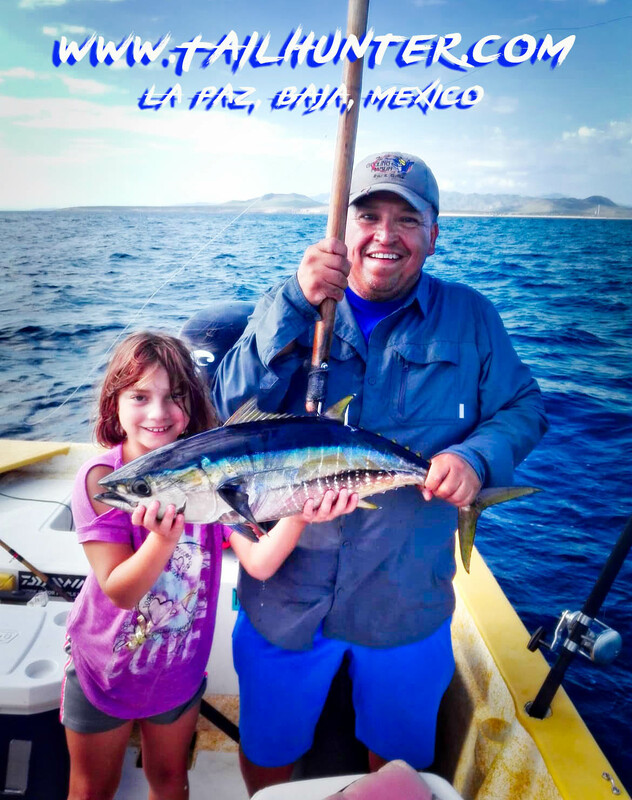 Selena is just 8-years-old, but was out all week with Grandpa Diego, Jimenez from Loveland, Colorado and caught dorado and tuna like this one! This is a good day! 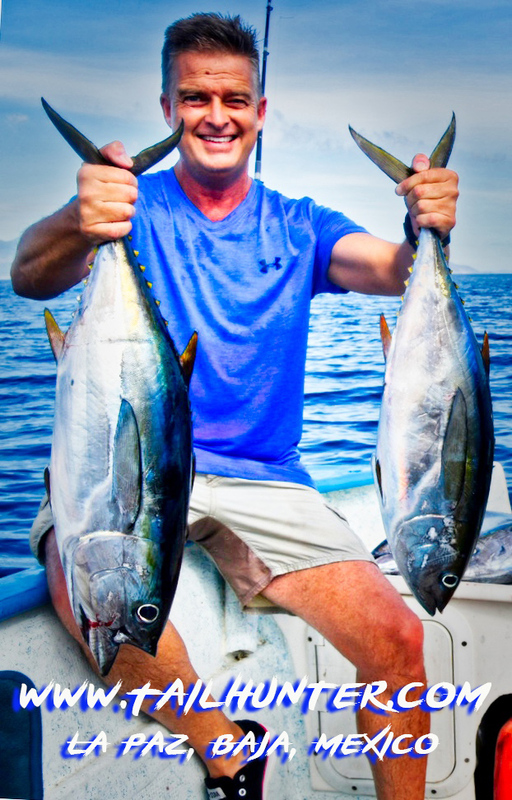 Mike Weinsz stacked up the fat tuna on the beach at Muertos. 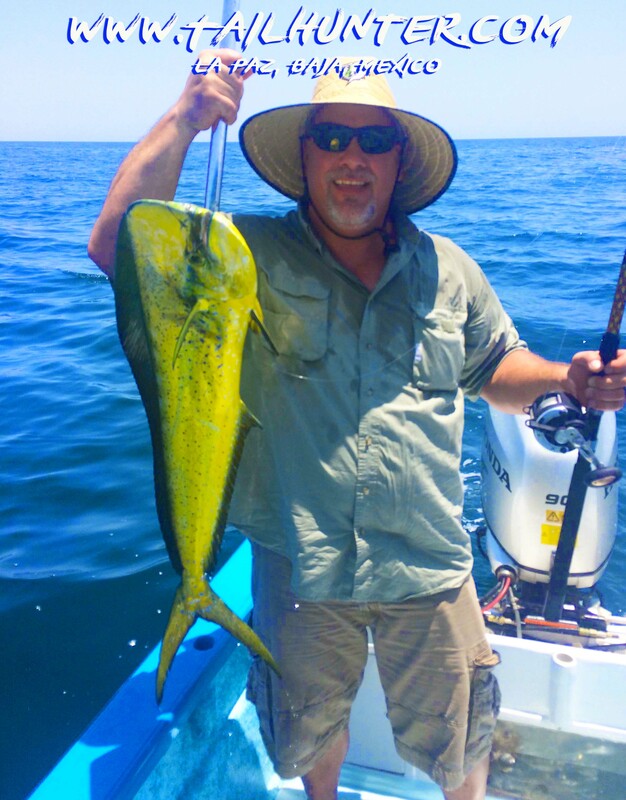 He also caught dorado. 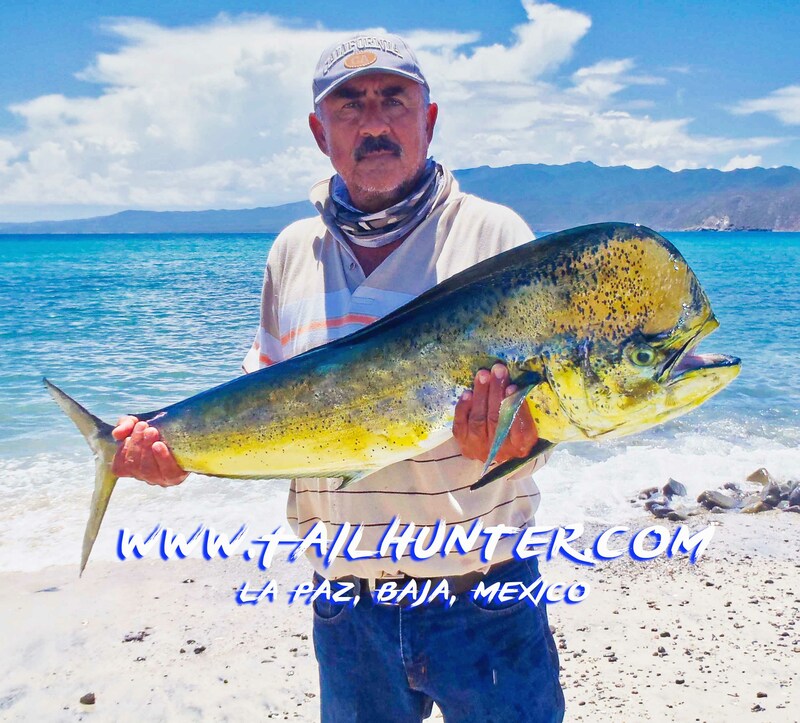 Dorado are the main catch for our Tailhunter La Paz fleet. 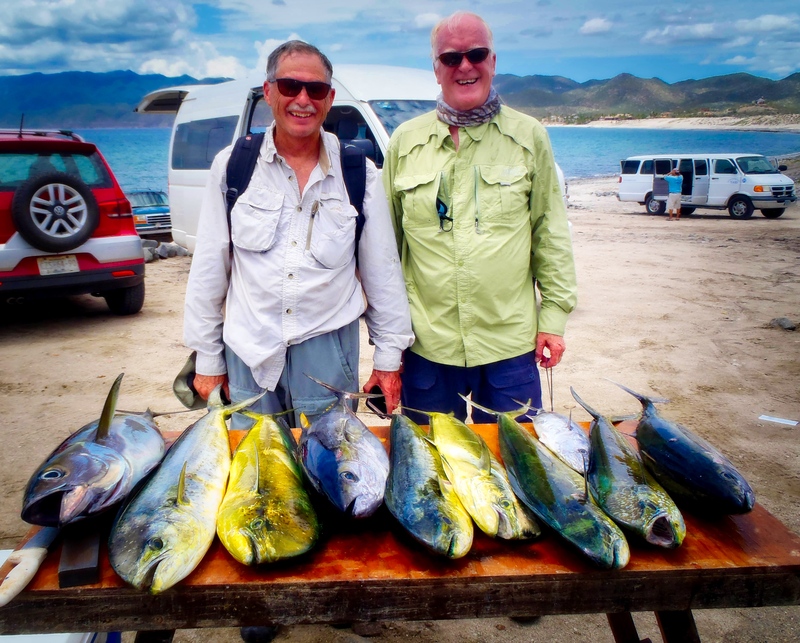 These were caught just at the mouth of La Paz Bay. Yea! Jorge Ramiro again with a hefty cabrilla. Punta Perrico in the background in shallow water! Summer is rolling out with some solid fishing as town empties of tourists as kids and families head back to school. 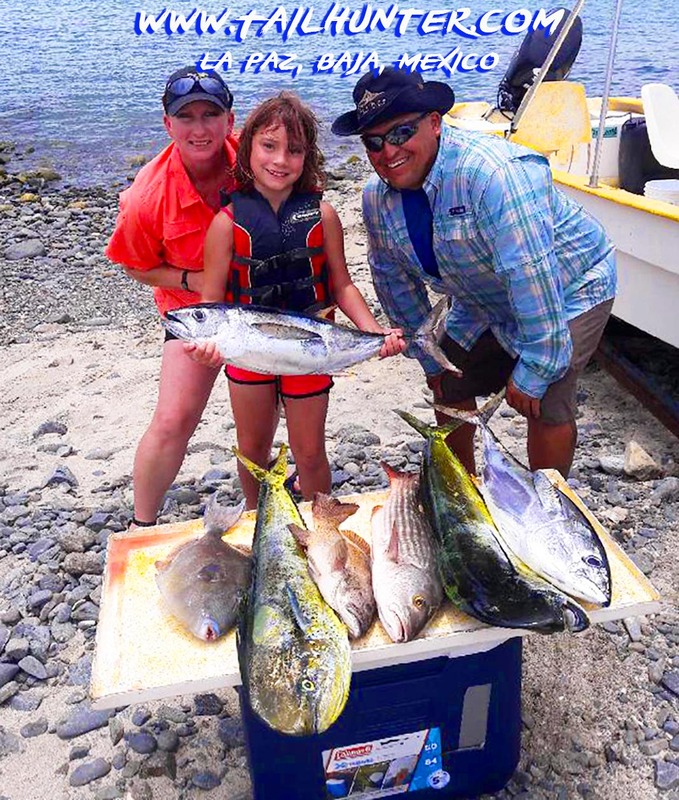 Hot humid weather with temperatures in the high 90’s and warm waters kept the fishing on the high counts, although afternoon localized tropical electrical and thunderstorms did pop up now and then although usually after everyone was already back from fishing. 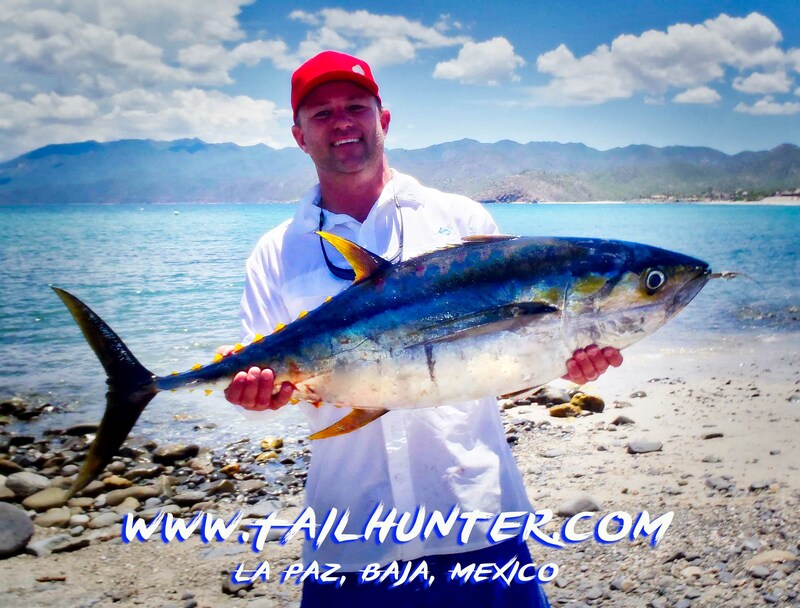 For our Tailhunter Las Arenas/ Muertos Bay Fleet, it lived up to it’s reputation with the fishing spot literally about 100 yards off the beach and tuna breaking within sight of where we launch our pangas. 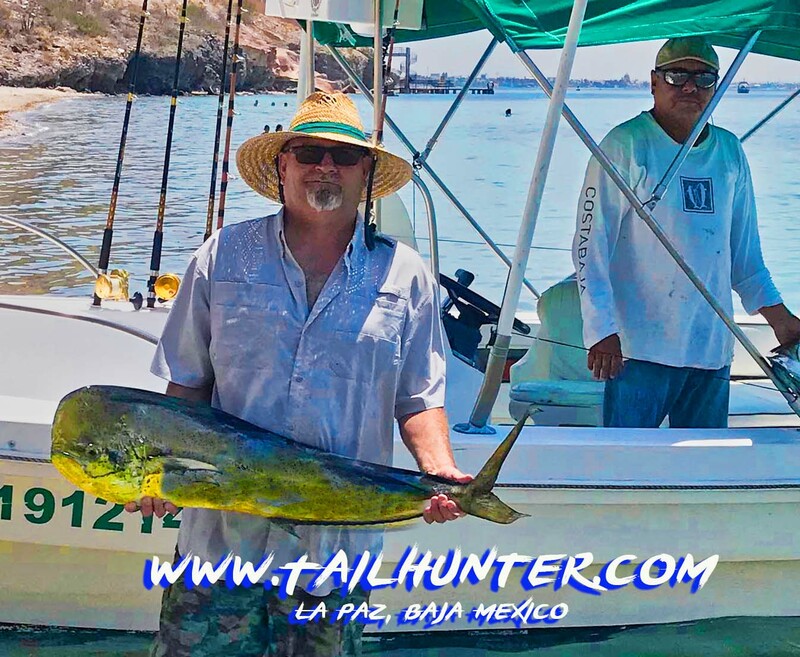 Tuna ranged in size from 10-50 pounds, but the same area also produced some nicer dorado in the 15-25 pound class as well. 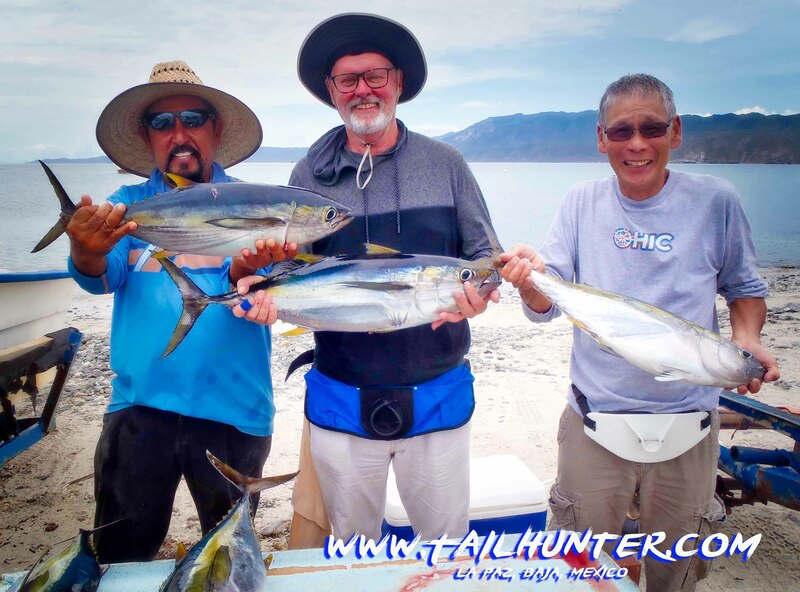 The same area also seems to be the hot spot for wahoo as we had several biters of wahoo in the 30 pound size and a number of fish that got bit off. 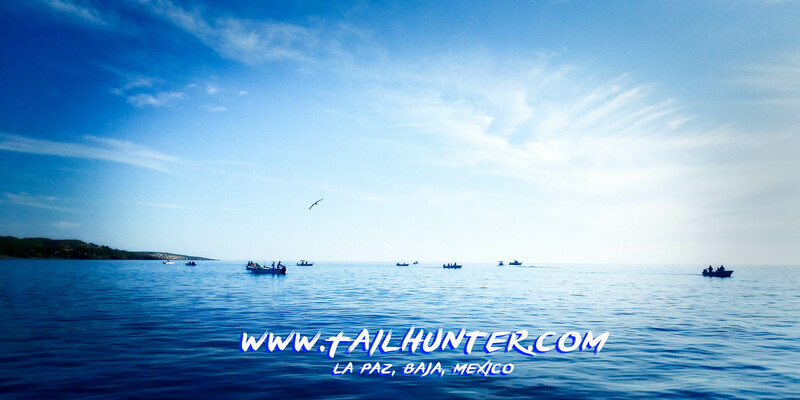 Our fleet fishing the tuna right at the mouth of Bahia de los Muertos. The point is right there behind the pangas. Water only about 50′ deep. The tuna are close! Thanks Mark Buchanan for this photo from the hill above Muertos Bay. 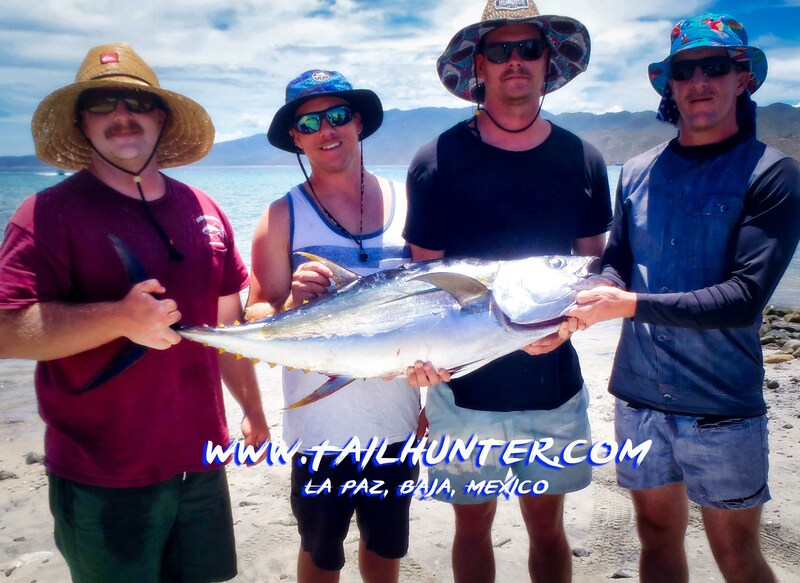 It’s our pangas fishing the tuna hot spot. Look carefully and you can see the bottom! 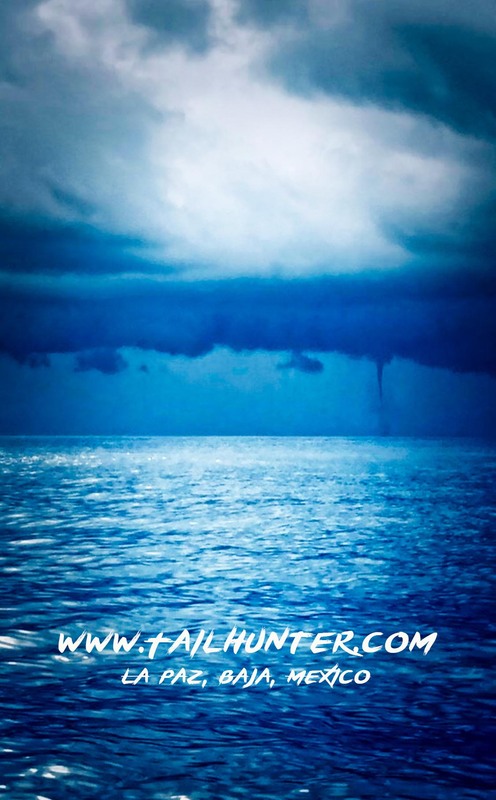 For anyone who thinks we need to go a zillion miles offshore to find fish! 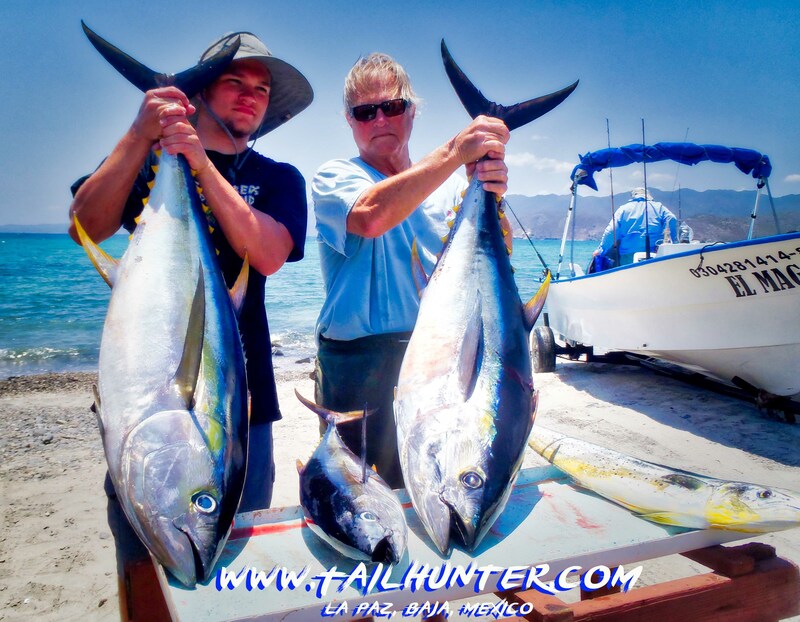 Tuna, wahoo and dorado all right there this past week! Also, notice how green everything is from the rain! 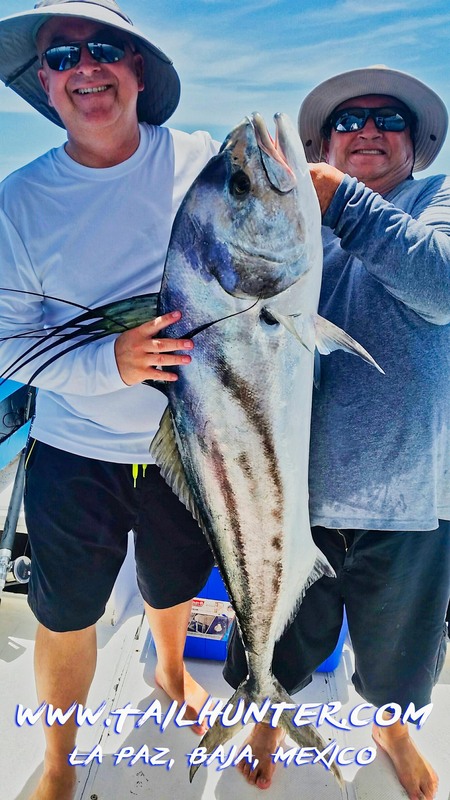 Inshore has continued to be surprising as cooler water fish that we don’t normally see except in the winter/ spring when waters are cooler were caught including pargo liso (mullet snapper), pompano, and big cabrilla. 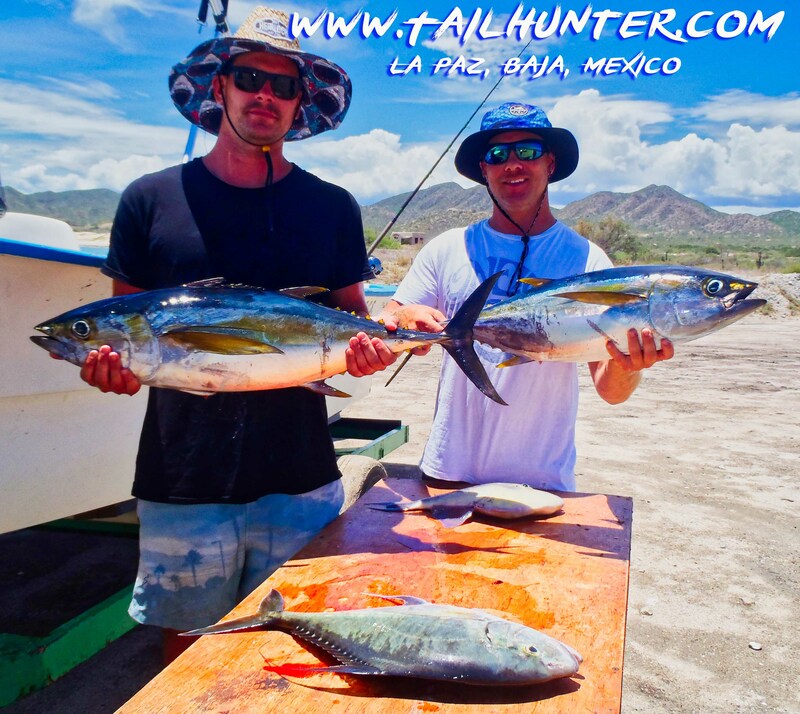 For our Tailhunter La Paz fleet, there dorado to be had. 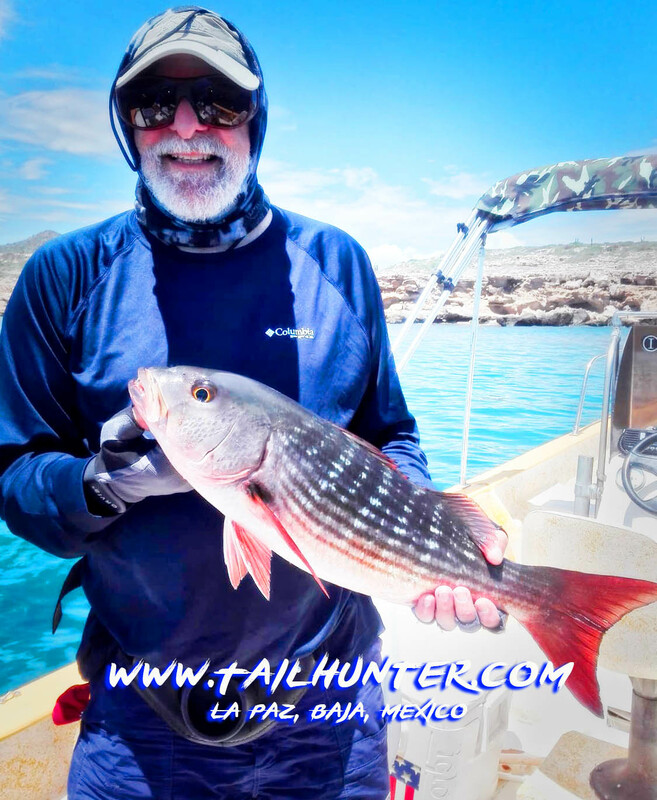 There’s smaller fish schooling right in the bay with larger fish out towards San Juan de la Costa and around the point at Punta Mejia. 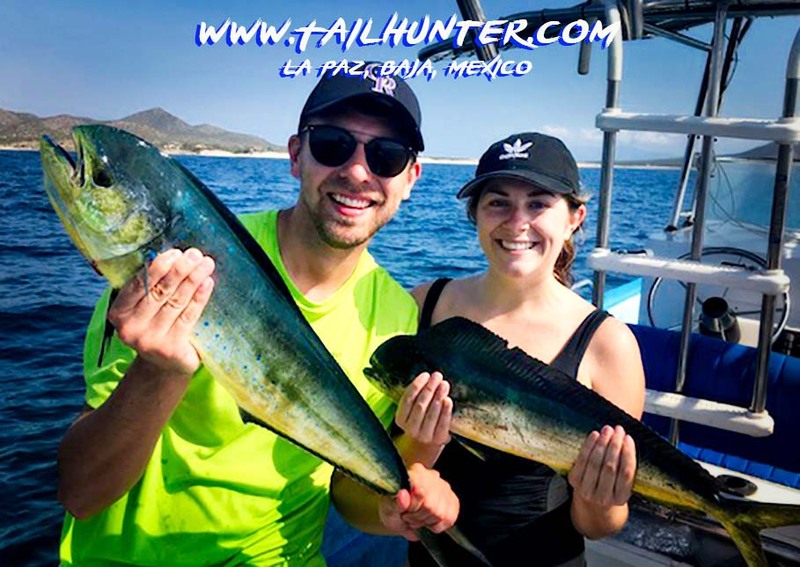 The smaller fish are as small as 5 pound “doraditos” that we mostly toss back, but fun to catch and up to about 20 pounds on the outside. There’s also some roosterfish biting around Bonanza Beach. 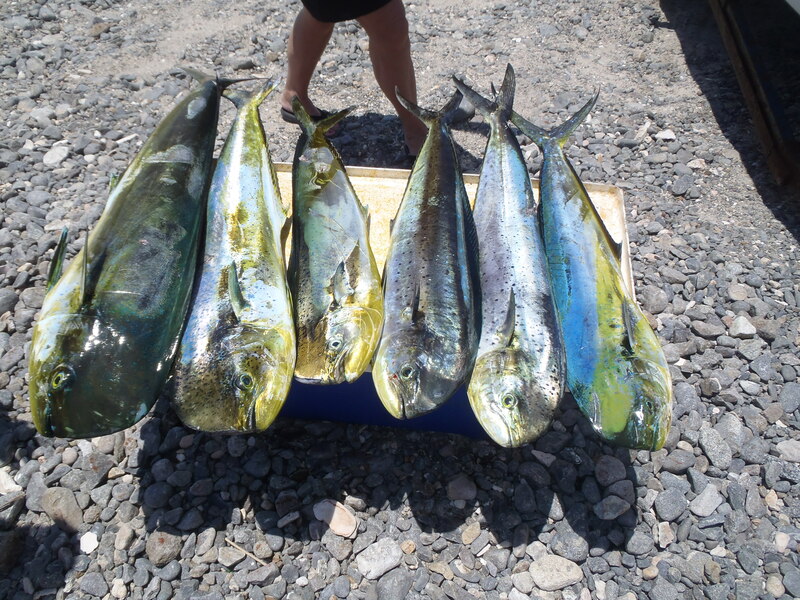 But dorado are 90% of the catch with some days better than others. Looks like some afternoon thundershowers coming later this week! 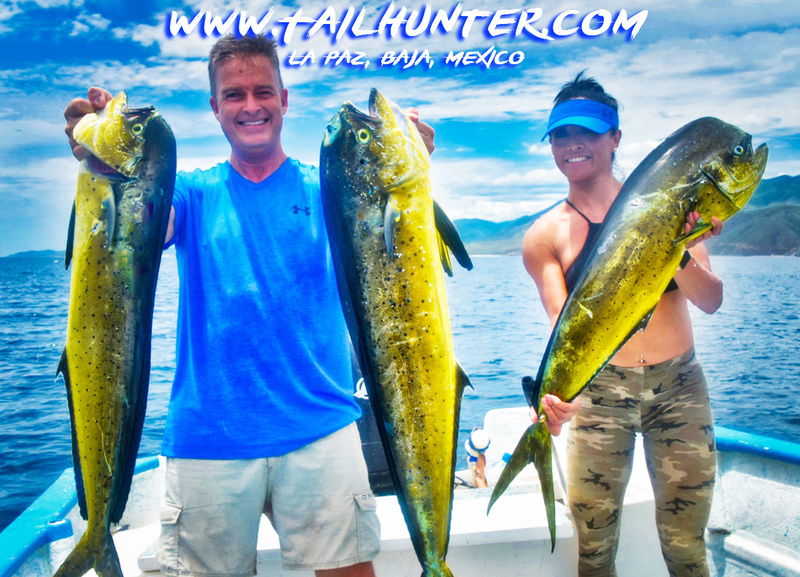 SUMMER TIME DORADO AND TUNA! Weather – Hot hot hot. Even us locals think so. Dangit…stay hydrated! Beer is fun, but doesn’t count. With the humidity you have to keep knocking back the waters or you’ll get sick. On the other hand…hot weather = best fishing! But, weather will change this week. Intermittent rain, thundershowers and lightning predicted on-and-off all week. Not sure what that will do to the fishing. Weather reports change several times a day. Not sure when or how hard it will rain or what days. Water – Pretty blue. Surface temperatures are perfect for swimming, SCUBA and snorkeling! It’s about 80-83 degrees on top! 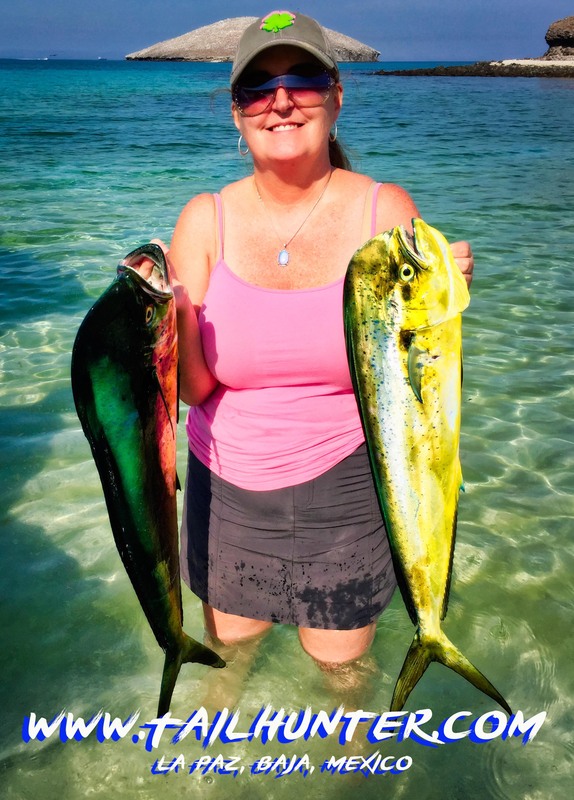 Fishing – Everyone caught fish! 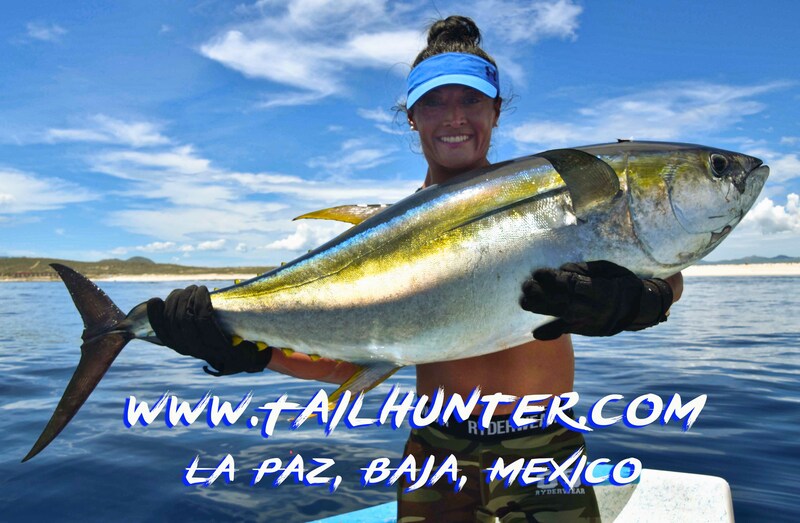 If not big tuna then great on the dorado. 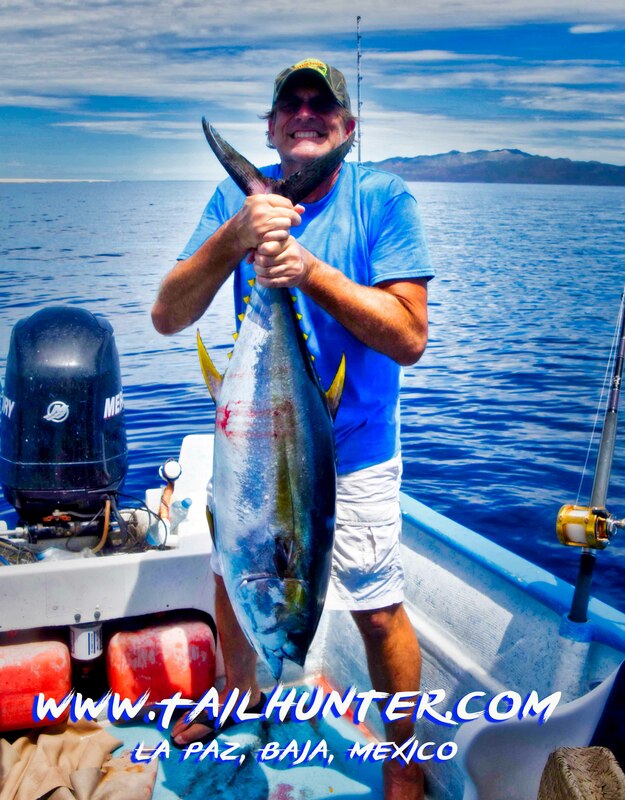 The tuna continue to be big and we’re losing most of the big fish. 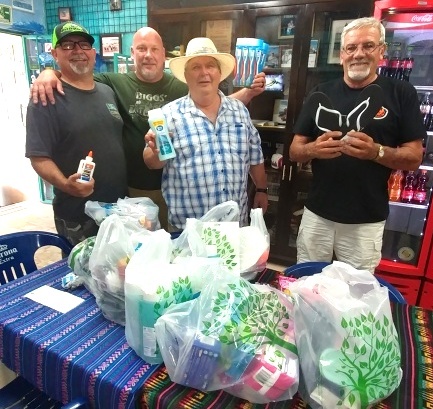 But dorado have been making up for it just to have fun. Catching – Losing 70% of the big tuna. That’s why they’re big. They are gorillas and make strong men cry! 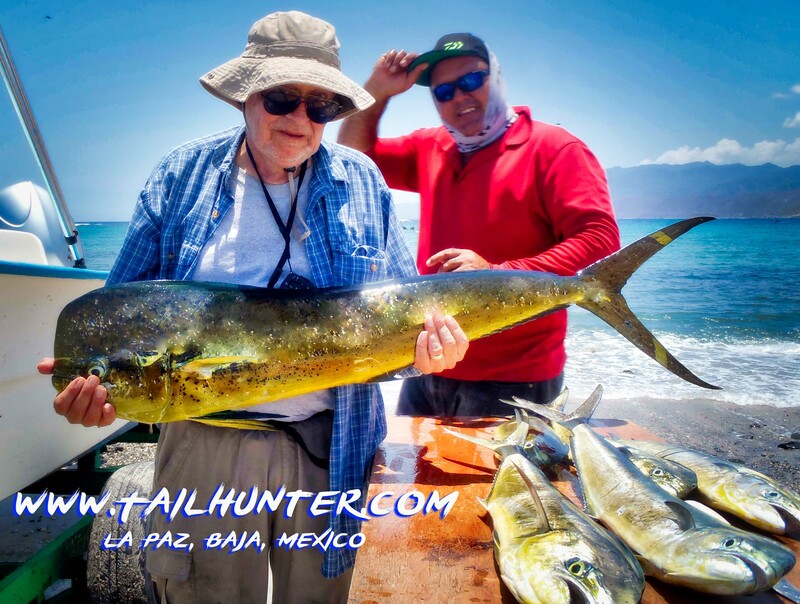 Rhett Riley and his grandfather, Herb Preszler from the Sacramento Area, tied into several big tuna off Cerralvo Island near La Paz on live bait with Tailhunter Sportfishing. They each hooked and fought a fish over an hour before lines broke then re-baited and tied into these two nice sluggers and fought then well over another hour before getting them into the pangas. 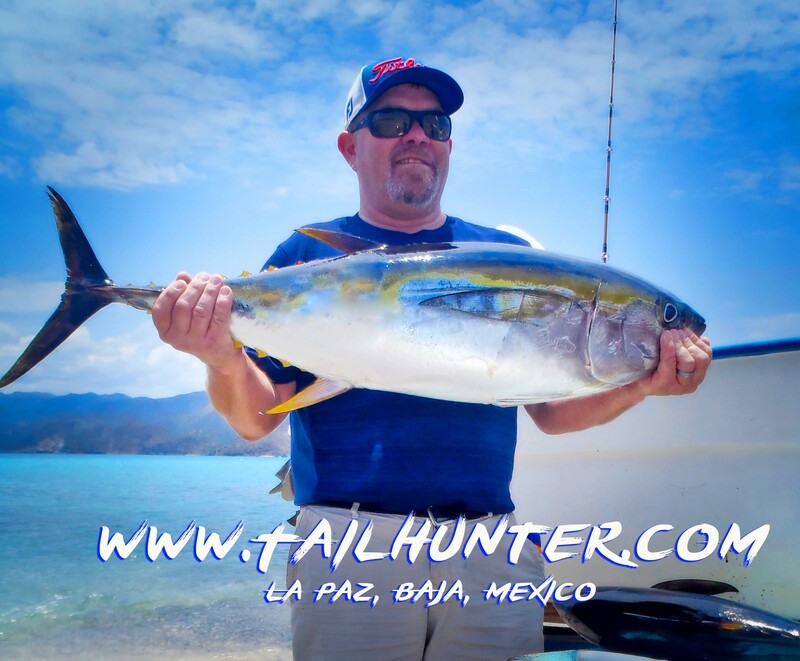 From Oroville CA, our amigo, Terry Biggs has made numerous trips to fish La Paz with Tailhunter Sportfishing. He had never caught a big tuna. 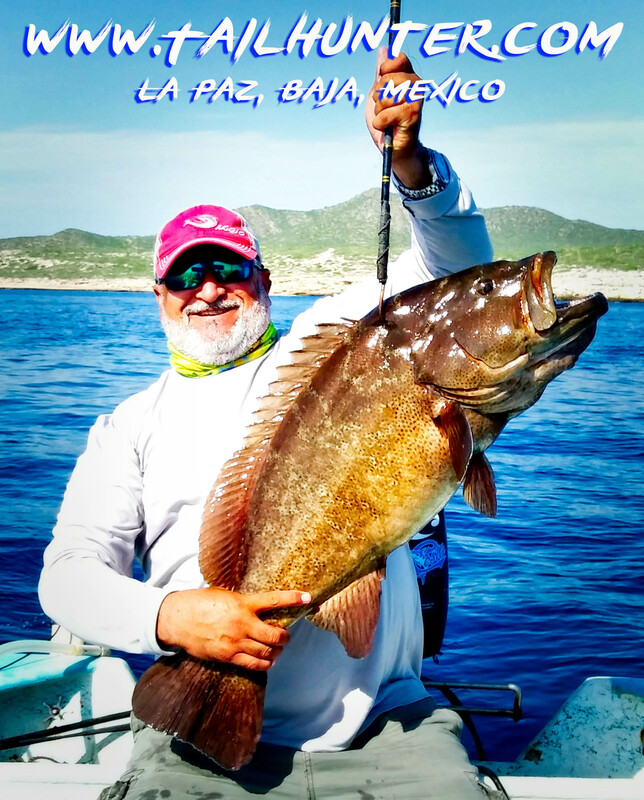 He hooked one fish and fought it almost 2 hours before it broke off then hooked this big one estimated by Captain Armando as being in the 70-80 pound class. He was using only 40 pound test. 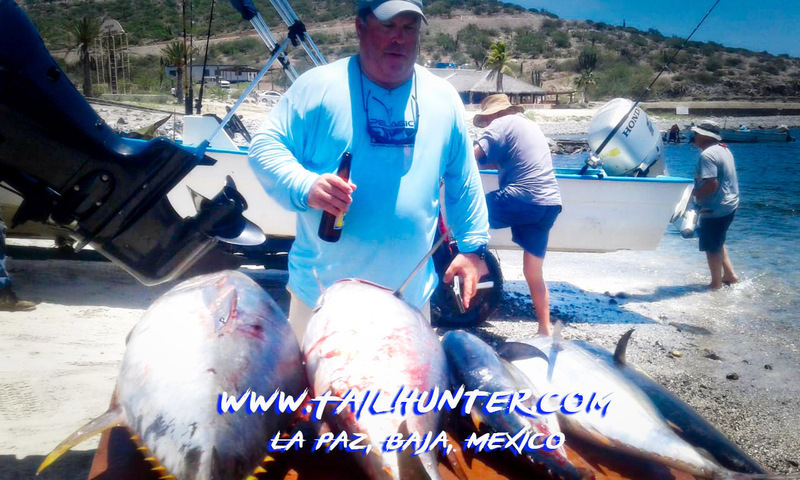 Terry works for the railroad and is about 6’2 and 275 pounds and he wrestled this tuna almost 90 minutes and “it whupped me pretty bad. One of our favorite new amigos, Matt Chase, was just great to have down this week! Even when he lost fish, we was like a kid in a candy store! 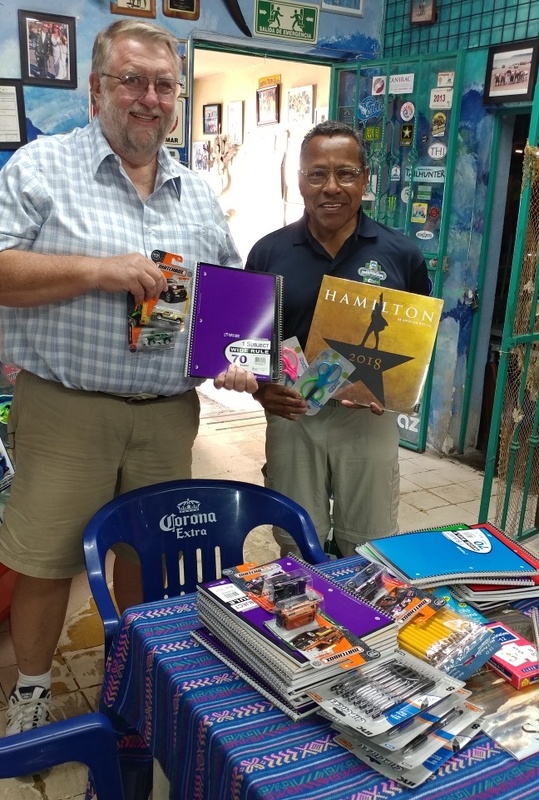 He did get a nice batch of dorado, however. Here with Captain Boli on the beach. 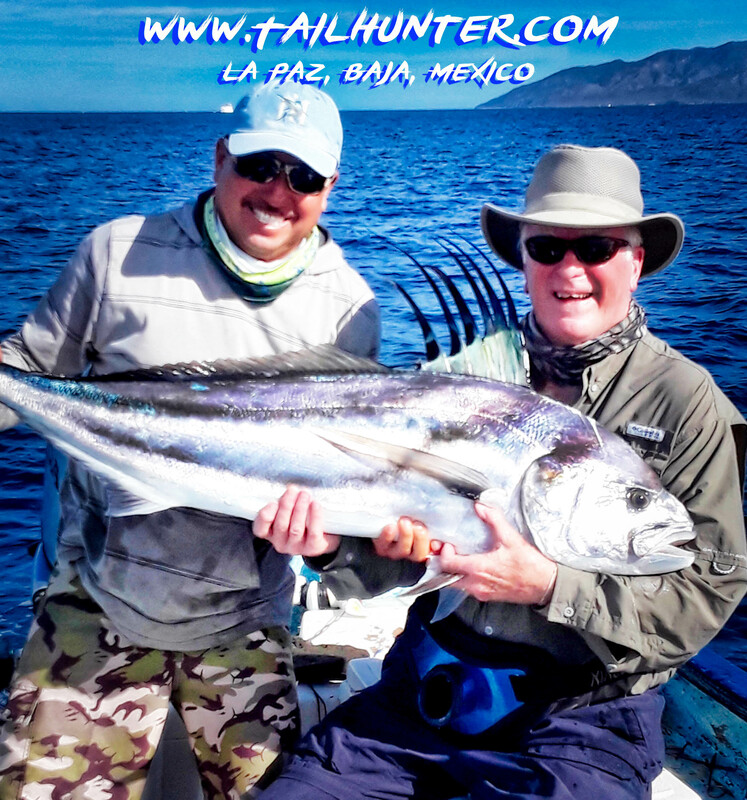 If he looks a bit disheveled, Mitch Embry from Texas has a little help and a smile from Captain Armando lifting up this tough tuna he fought in the hot sun off Cerralvo Island. 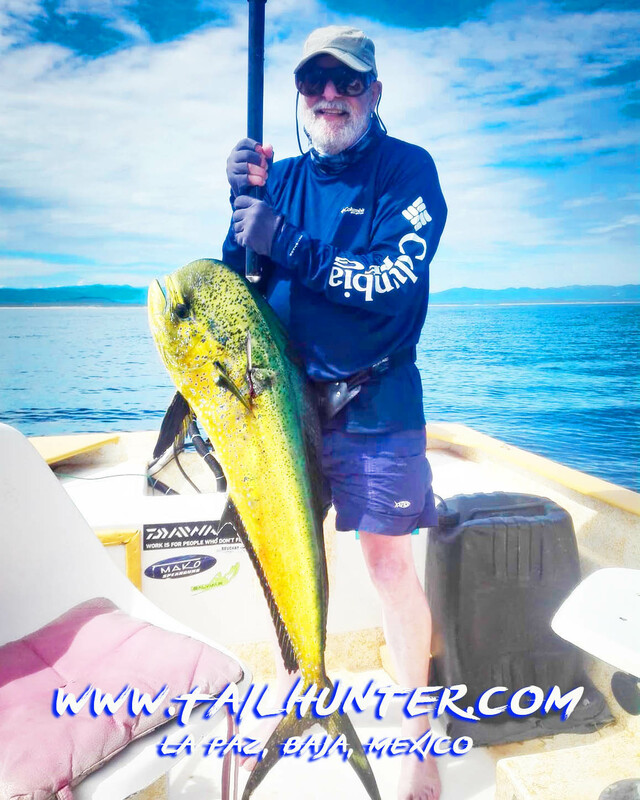 Schoolie dorado for the Bartas who were staying with Gary Wagner at Rancho Costa in Muertos Bay. 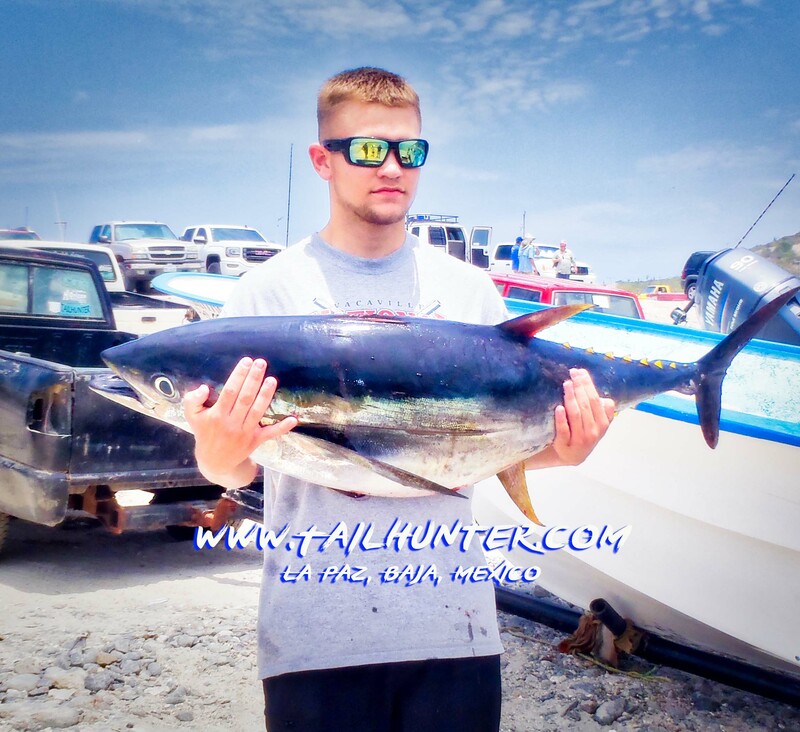 Rhett Riley started out a good week of tuna fishing with this plug of a yellowfin tuna. 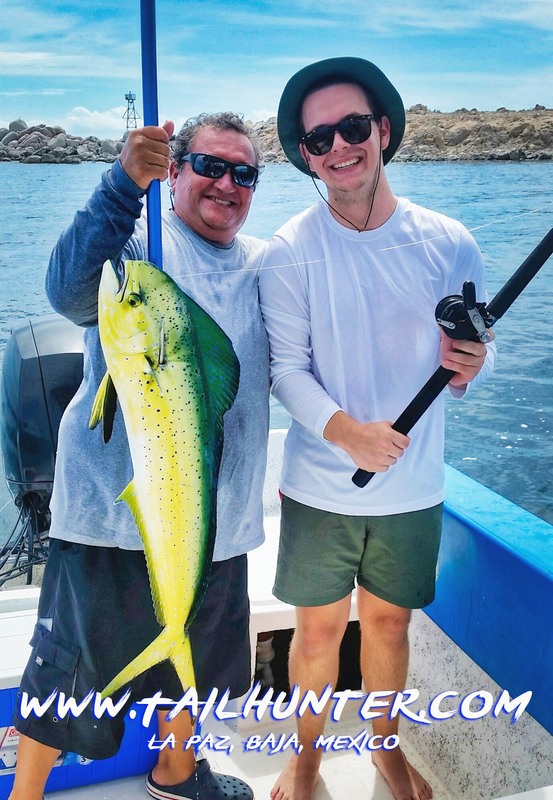 Another dorado in the boat is a nice bull north of La Paz near Espirto Santo Island for Terry Biggs. 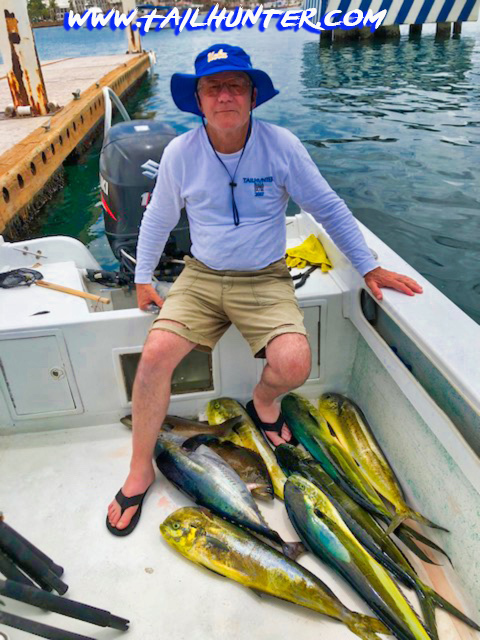 Well-deserved handshakes for Wes Perkins and Roger Hall who fished with Captain Victor and took a box of dorado and a big yellowfin. Our good amigos are from the Portland OR area and have visited us for many seasons. 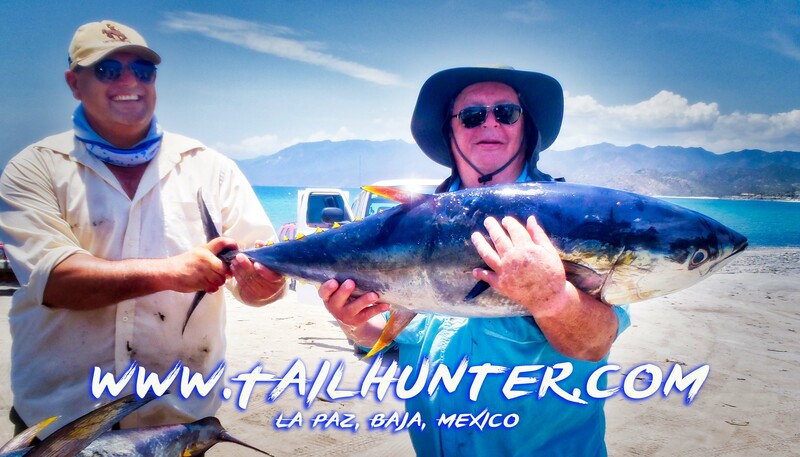 First timer amigo, Mark Durham, poses on the beach at Muertos with another fat tuna. 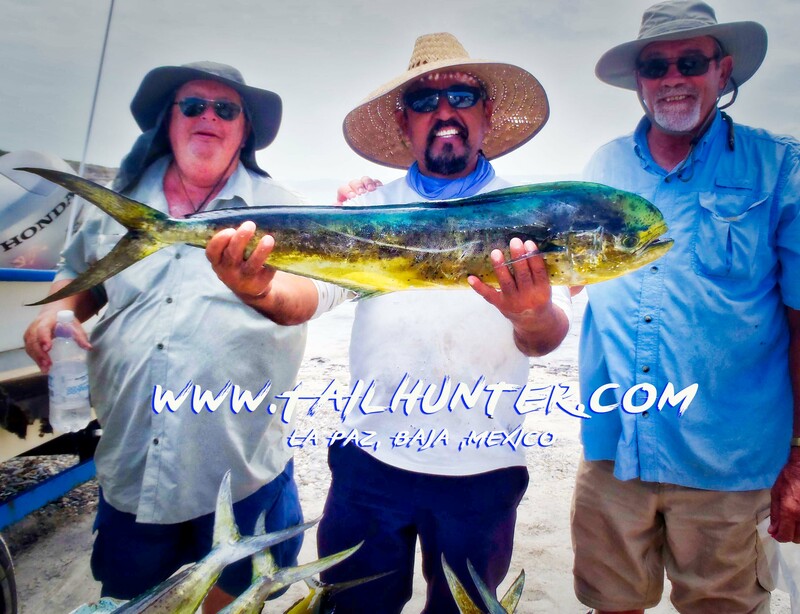 Captain Jorge does the honors on a nice dorado with Rich Keough and Mitch Embry. Note all the other dorado on the cutting table in the foreground . It was a pretty decent week of fishing. Everyone who wanted fish caught fish. Can’t argue with that. Some boats did better than others on any given day, but that’s fishing. If you fished several days like most of our folks then you might have one slow day, but the others surely made up for it. 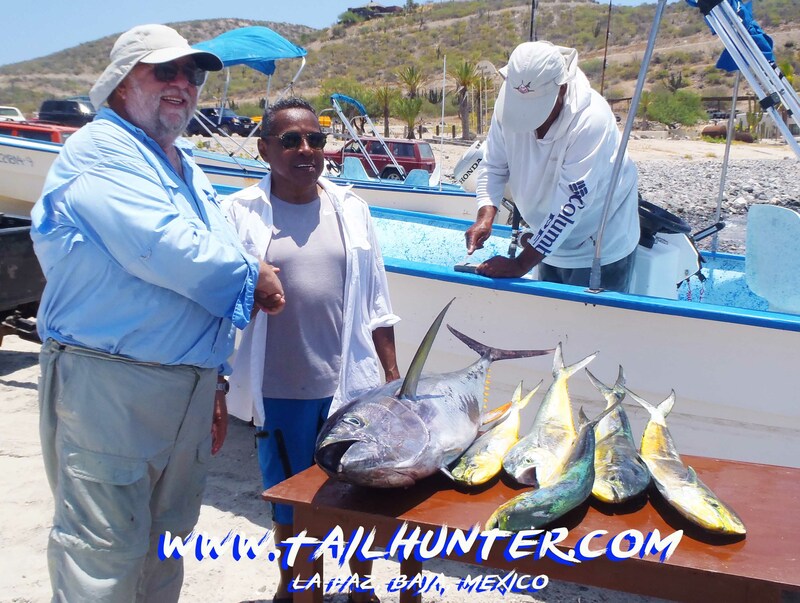 At Las Arenas/ Muertos Bay, the big tuna off Cerralvo Island were again, the name of the game. These 40-80 pound gorillas are made more formidable by the fact that they’re eating relatively light lines (as tuna will sometimes do). 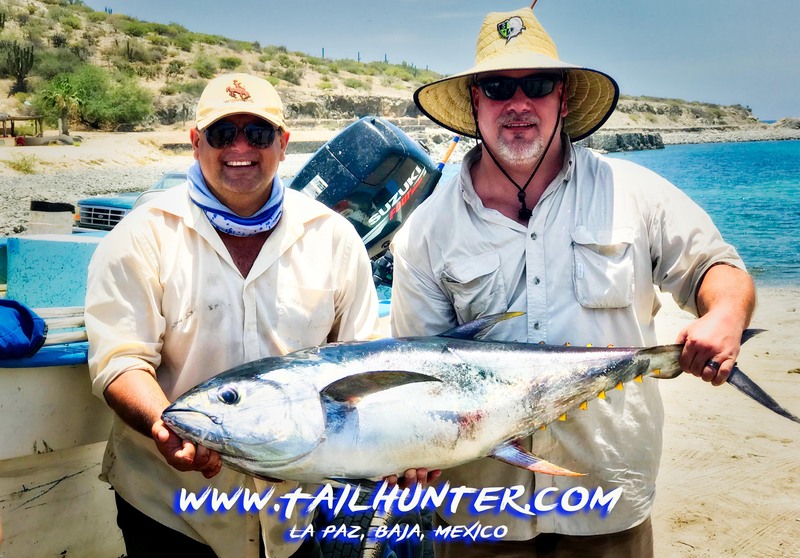 So, using 25-40 pound test line can turn into quite a battle and most of these fights are at least an hour to almost 2 hours in the hot Baja sun! For some, the strain is just a little too much for the angler or the tackle and beast fish that have non-stop motors. We are losing about 70% of these fish for those reasons. One day, we hooked 10 fish and only 2 got boated. It is what it is. Everyone wants a shot at these homerun fish, but if you don’t knock it over the fence, there’s a good chance you won’t get any other chances at another or for other species because it’s already too late in the day. But the challenge is there and very compelling. . .and fun! 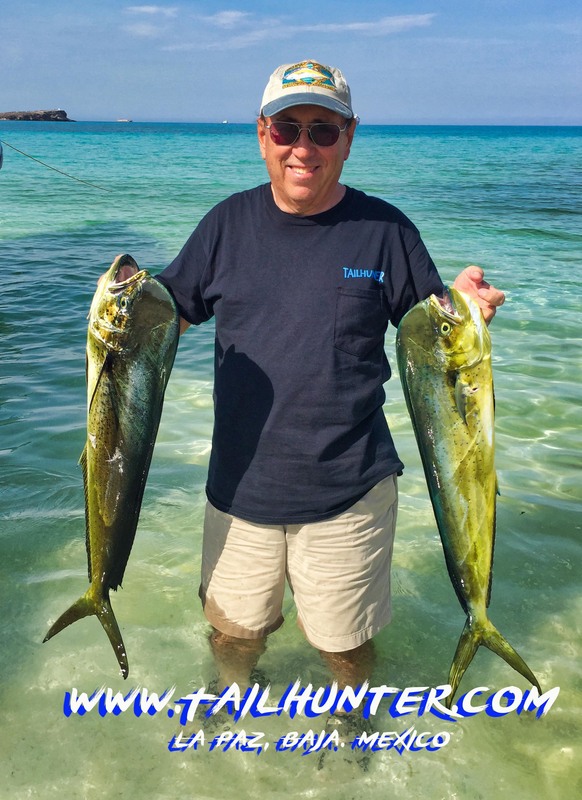 It’s hard to know if there’s other species around the area because everyone is chasing the tuna, but we did hoo up some dorado and billfish. Roosterfish have been scarce this year. But, again, hard to know because not many folks have been chasing them. 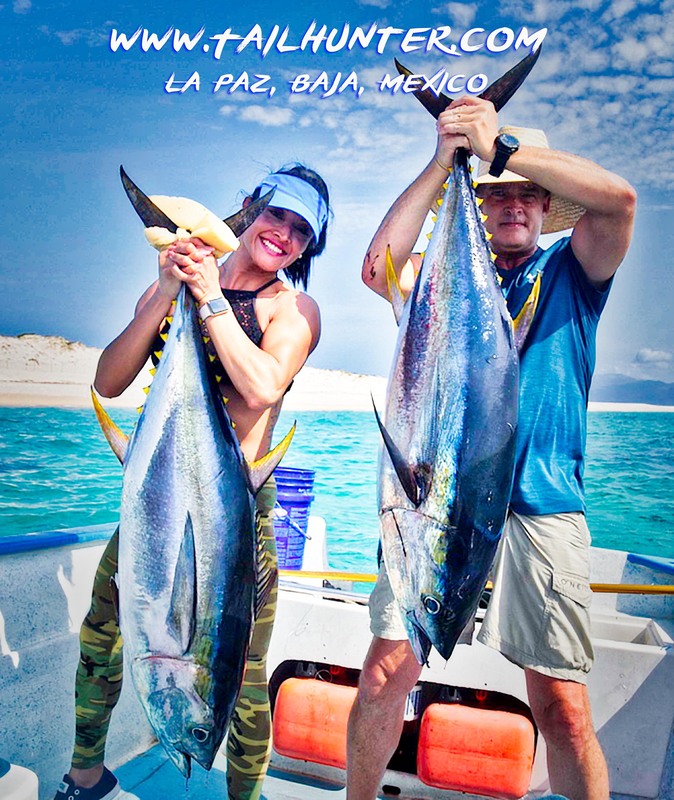 Fortunately, if the tuna aren’t going, we do have our other fleet out’ve La Paz and the dorado have been lighting it up . Most days there’s limits or near limits of fish running 10-20 pound and some larger. If you hit the right spot and find the school, it can be utter madness as fish crash all around and every rod is bent. You fill the box quickly! Other times, you get 1 here…2 there…1 here…and a longer, but still productive day. 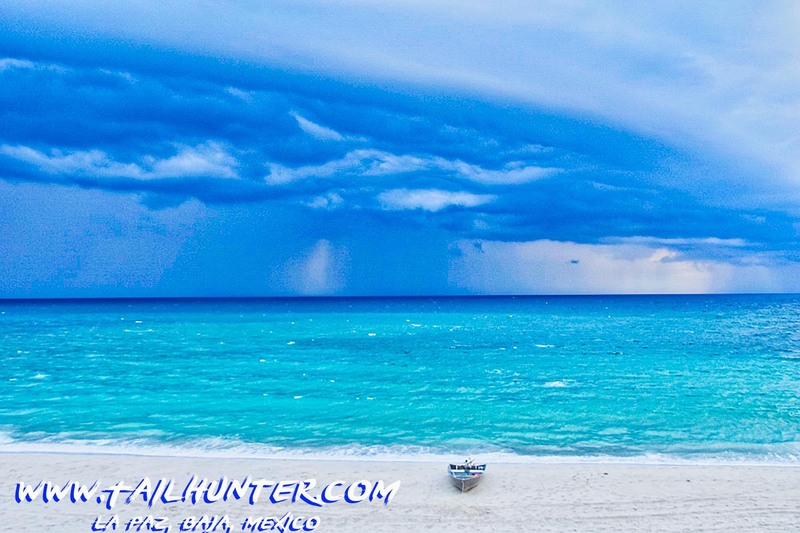 Weather advisory…looks like intermittent and localized thundershowers with lightning are predicted most of the week. Not a hurricane. Just tropical stuff. Not sure how that will affect fishing, but we’ll be watching. It could rain one spot, but not another. It could rain at night or afternoon. The reports change daily. Hopefully, the port captain doesn’t shut thing down.